Montgomery Station is is a three level underground station for BART and Muni Metro in the heart of the San Francisco's Financial District. 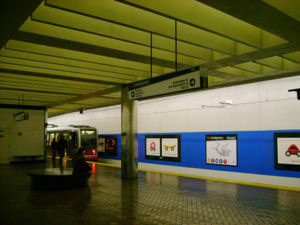 This station, along with Embarcadero Station, are the most used stations in the whole BART system. 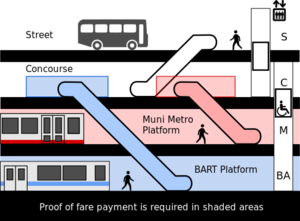 Muni Metro and BART share the same concourse but have separate platforms in different levels. Each system has its own faregates and station agents. lines serve this station underground. Ticket machines are available at the underground station concourse. First time riders must purchase a reusable BART ticket or Clipper card from a machine before boarding. All riders must pass through the faregates with a valid ticket or card. Keep the ticket or card for the ride and use it to pass through the faregates again when exiting the station. 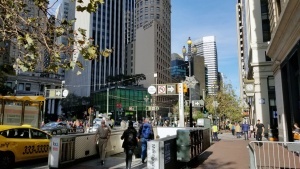 Muni provides local bus service within San Francisco. Lines 8, 30, 45, and 91 stop on 3th Street in the northbound direction, and 5th Street in the northbound direction. Powell Station is closer to the 5th Street bus stop. F-Market & Wharves street cars stop along Market Street. Board streetcars on boarding islands in the middle of Market St by 2nd St (to Castro), by New Montgomery (to Fisherman's Wharf) and 3rd St.